Painting my front door has been on my to do list for almost seven years now, but it was one of those projects that kept getting pushed aside for more pressing issues. 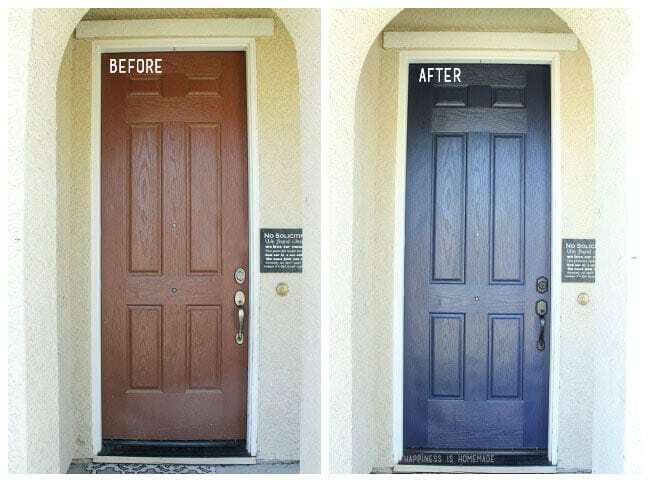 Day in and day out, I’d see this door color and cringe. In seven years, I have hung up exactly one wreath (for Simon’s cowboy party three years ago!) 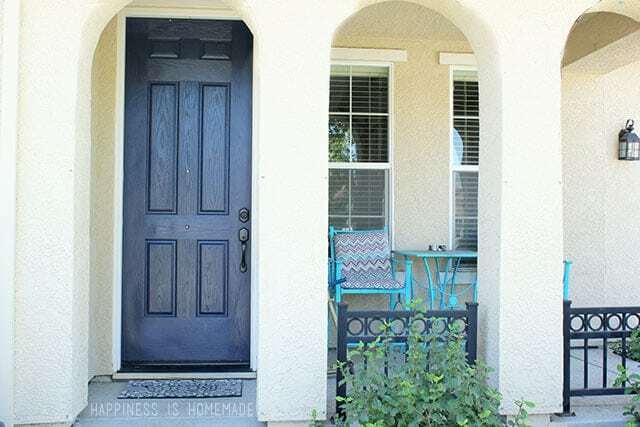 on this door because nothing looked nice against this funky color (it also goes really well with my aqua patio furniture, don’t you think?). I honestly don’t think that I could have hated it more. Just in case you need a closer look at the color…it was an awful shade of not-quite-brown and not-quite-rust and 100% ugly. 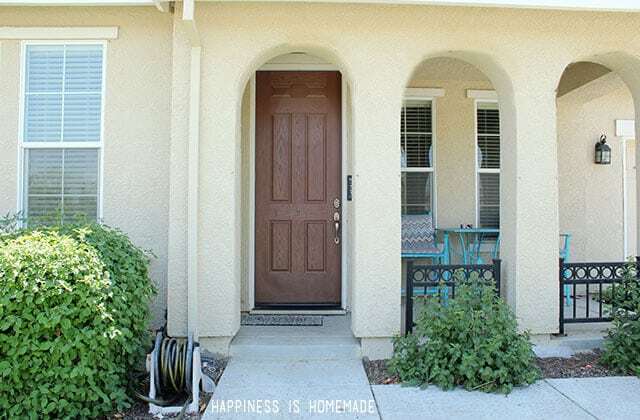 I had the pleasure of meeting the team from Modern Masters at the SNAP Conference last year, and I told them the story of my lackluster front door and how I had been putting off the task for year and years. I was able to test out some samples of their paint, and I was amazed with how well it covered and how easy it was to use. 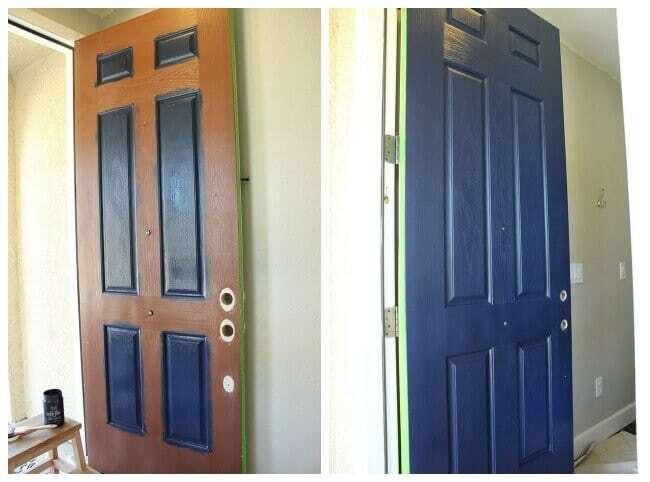 Maybe this door painting thing wasn’t as hard as I was envisioning! 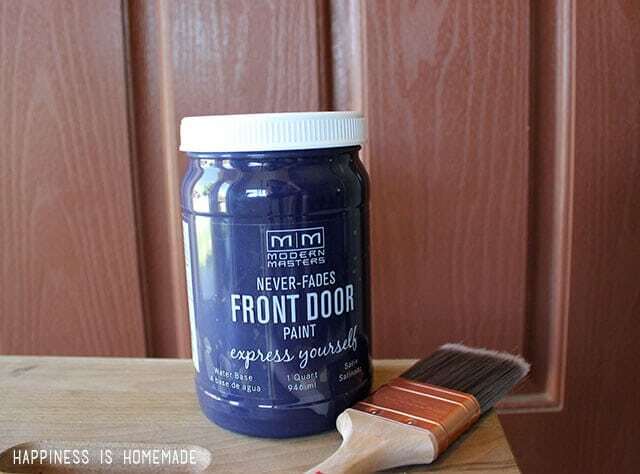 Modern Masters graciously sent me a quart of their new Front Door Paint to give my ugly door a makeover, and I couldn’t wait to get started! My husband power washed the front door for me, and the kids gave it a quick scrub down to remove any leftover dirt and grime. 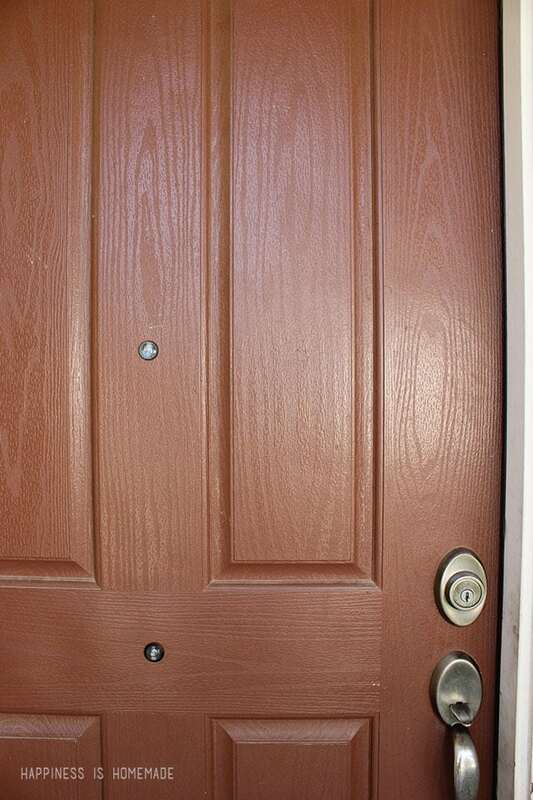 Our front door handle wasn’t working properly, so we took advantage of the situation to upgrade our hardware as well. Sawyer removed the hardware for me, and since the old handles left a bit of a raised ring in the paint, he quickly sanded it down for me. Ready for paint! 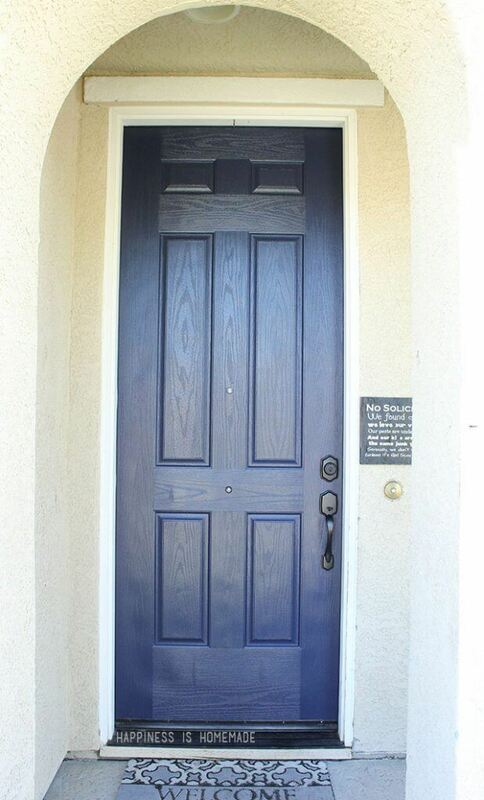 The color that we chose is Peaceful (a deep navy blue) from the line of never-fades Front Door Paint. I love that the blue will provide a nice colored backdrop for all of those holiday wreaths that I foresee in my future! I grabbed a brush and got to work. A quick Pinterest search taught me that I should paint the panels first, then the interior vertical rails, followed by the horizontal rails and finally the two long vertical rails along the edge of the door. I seriously couldn’t believe how fast the job went! I teased this sneak peek on Instagram after the first coat, and everyone seemed to love it as much as I did! 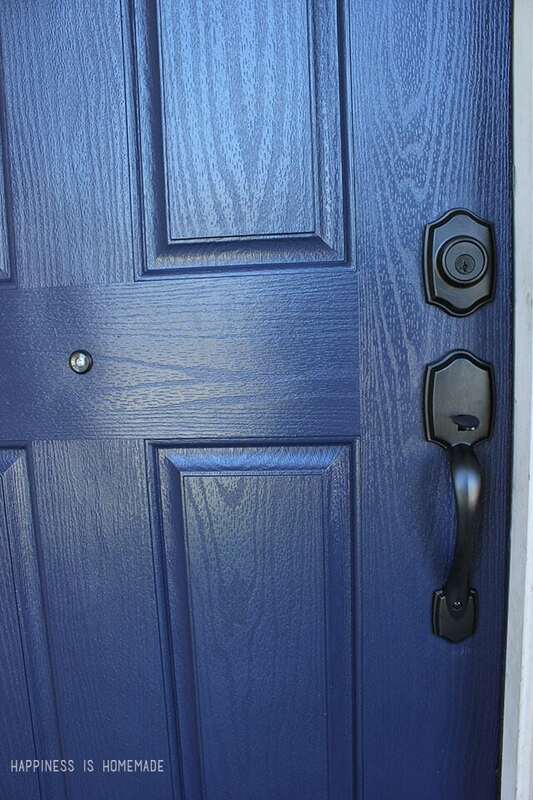 The paint goes on smoothly and dries quickly so that you don’t have to worry about leaving the door open (or making sure that the neighbor kids don’t come knocking too soon and ruin your hard work!). Best of all, I didn’t even use half of the jar of paint with two coats, and I probably could have gotten away with just one! The bright blue in this photo is how the paint looks while it’s still wet, but it dries just a shade or two darker. We installed the new door handles, and the whole project was finished (including drying time!) in under 4 hours – amazing! I love it SO much, and I can’t believe it took me so long to get motivated and do something about it! The Modern Masters paint was honestly a dream to work with, and it made this project quick and totally painless. Now my aqua and purple patio furniture look like they belong on this front porch! Everyone loves a good before and after shot, right? Thank you to Modern Masters for providing me with the paint to make this transformation such a success! I already have a few more projects in mind for ways to freshen up the rest of the porch now, so stay tuned! I am interested in the little sign that is next to your door…No Soliciting. I would love to know what it says. Love how easy you made this look! I am, however also interested in your No Soliciting sign… can you clue us in?! Thanks for all your inspiration. I love the blue door!! It looks great!! Love it!! The blue adds so much more character! 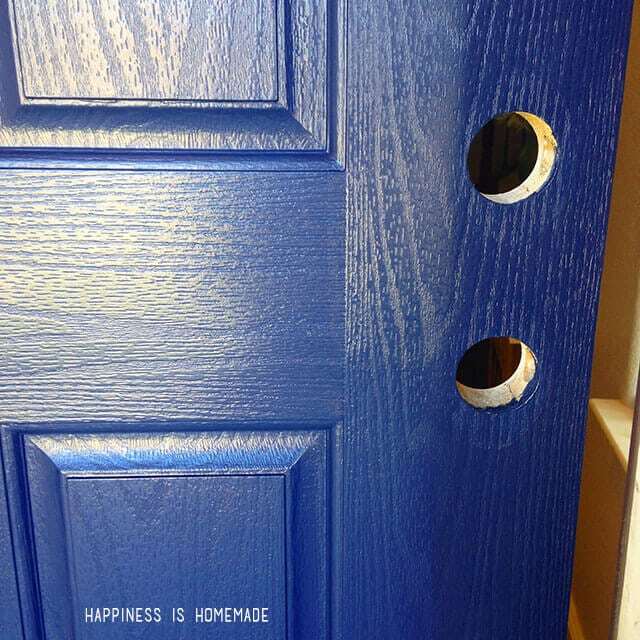 Your front door looks great!